A bus full of Husky fans ( a few Cougs joined us) headed down to Pullman for the 101st Apple Cup which was dubbed the "snow globe" game. It was cold, wet and snowy but the Dawgs came home with the trophy for the 6th year in a row. Thank you to everyone who joined our inaugural Spokane to Pullman Apple Cup bus trip. Over 2500 hundred 5th graders gathered at the Spokane Convention Center for the T (Technical) 2(year college) 4( year college) college and career fair. Six colleges and universities were in attendance along with local law enforcement, lawyers, fire fighters and scientists, among others. UW was the bag sponsor again this year, all 2500 kids were running around collecting information from local companies and schools to put in their UW branded bag. 63 students (9 of which were GU undergrads who did research at UW) gathered at Gonzaga's Hemingson Center for a poster session to discuss what projects they worked on this Summer. 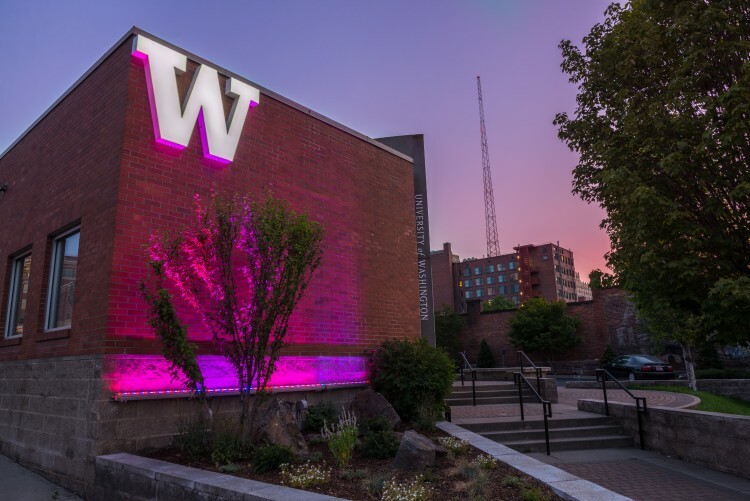 Located on the edge of downtown, the UW Spokane Center is an information and engagement hub for Spokane-area alumni, students, prospective students, parents and supporters. 201 W. Main Ave. Spokane, WA 99201 / Hours: Monday–Friday 8:30 a.m.–5 p.m. The Office of Spokane and Eastern Washington Relations advocates for growth of medical, physician assistant and dental education and works to attract students from the eastern part of the state to the University of Washington. We are excited about growing the UW presence and spreading more purple!